Why I’ve been sewing with acrylic (and why I’ll never do it again). 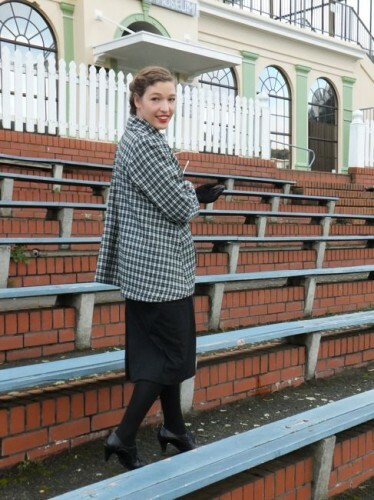 You may have noticed that I’ve sewn two things recently with cheap acrylic fabric: my ‘Win in Black and White‘ 1940s swing coat, and the Reproduction jacket. And she’s absolutely right! And this is something I know, and have known since my earliest sewing days. I am the product of fabric snobs (in the nicest possible way). My mother is a fabric snob who managed to live through the 1970s without every wearing synthetic clothes. 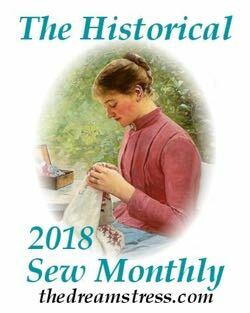 My first sewing teacher taught me to work with lovely quality quilting cottons, and then I went away to university where I worked for a professional costume shop that only used the best materials. 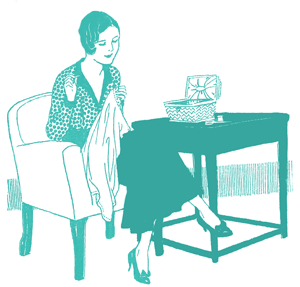 As a historic seamstress, my stash is full of natural fibres: I sew in silks and linens, cottons and wools. I barely tolerate rayon and the other processed naturals. So why have I been sewing in acrylic? Because I am a fabric snob. I’ve never worked in synthetics. I was told not to waste my time on them, and I was a good little student, and didn’t. So other than knowing that they feel nasty to the touch, are nasty to wear, and don’t breath well, I don’t know what it’s like to work with synthetics. And now I’m teaching regular sewing. And I don’t think it’s fair of me to just say “Don’t work with polyester. Don’t work with nylon. Don’t work with acrylic.” if I don’t know why. So I decided to do penance in pursuit of knowledge. I sewed with acrylic. I’ve given it two fair trials. I’ve made two garments, tried a variety of techniques on them, and finished the garments properly. I’m pleased with both garments. But I’m not pleased with acrylic. I will never, ever be working with it again. It is evil. And I know this for real reasons, because I’ve trialled it, not just because I was told. I can tell students (and other people) why they shouldn’t work with acrylic with a totally clear conscience, and with real knowledge of what it is like to work with. So why shouldn’t you work with acrylic? Acrylic doesn’t iron well. When you try to press seams and details into it the acrylic just goes limp, and won’t sculpt. At the same time, it stays weirdly crisp when it it’s warm: it won’t shape into lovely curved and sleeve heads. Despite its drape, acrylic doesn’t actually hang well. Acrylic has poor coverage for its bulk. Unless it is thick, tightly woven, and in a dark colour, your lining and undergarments are going to show through. It wears poorly. 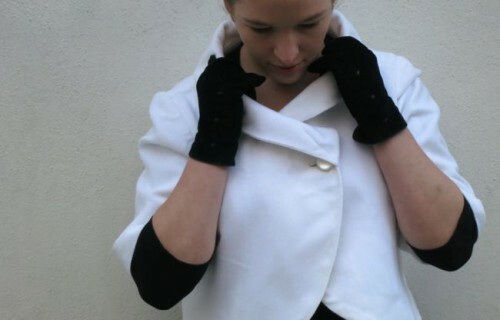 The cuffs of the Win in Black and White jacket are already pilling – and it’s only been a week. So yeah, it’s hard to work with, doesn’t feel nice when you work with it, doesn’t feel nice when you wear it, and doesn’t wear well. Don’t sew with it. Any money you save in fabric will cost you in work. 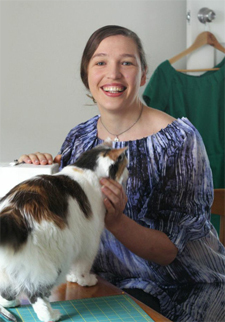 I sew with knits and even for knits you can stick to mostly natural fibers – cotton, merino, silk, and the bio-sourced viscose and rayon. If you aren’t just torturing me, PM me about that jersey!! I’ll make it worth your while! I feel like singing hallelujah! I was on the verge of offering to send you a care package of Good Wool. You are right about everything. And I, too, am a fabric snob. But you know, there was an exception. I hate to say this word, because it has become a rather long four-letter word – crimplene. I never sullied my machine with it, but my mother fell, and made herself suits and jackets. And you know, the darned stuff pressed like a dream on the seams and the topstitching – it really liked topstitching. It was thick enough to hang well and it was kind of slippery on the inside, so it never grabbed. And it blithely went into the washing machine and dried absolutely ready to wear, with narry a crease or a wrinkle. A bit like the Bri-nylon that was around when I was in my twenties. Made wonderful knits, that looked as good the day I gave them away twenty or so years ago as they did when new. Makes you think of conspiracy theories – did some evil manufacturer buy out the formula for the fabrics that worked to keep selling the ones that produced instant customer dissatisfaction and need for new clothes? Probably not. And I am glad crimplene is gone – there was something just not right about the stuff. Bring back the sumptuary laws! Did you know that you can actually get wool coffins now? Good idea. Here! Here! It is the same with knitting yarn. Against my better judgement I trusted my favourite yarn company when my latest pattern called for a 33% acrylic yarn. I know the resulting fabric bobbles even before knitting is finished and I know how much I hate the ‘squeek’ of the darned stuff as it reluctantly changes needles as I knit, but I took the risk and am regretting it. Never again. It is wool, cotton, silk and bamboo for me from now on. I will stay on the path of natural yarns and fabrics. It does a great injustice to the effort and work one puts into a garment if it is made of substandard material. Being a fabric snob (and proud of it!) makes shopping very difficult however. To my dismay, I saw a 100% polyester suit in a high end women’s clothing store recently and it cost $599! For polyester! I have put many a knitted garment back on the rack when I found it was made of acrylic and walked out of the shop in disgust when I saw they were charging extortionate prices for such a cheap and nasty yarn. We must stand our ground in the name of quality. I’ve only ever knitted with acrylic (can’t find wool…wool anywhere) and last time I tried my skin came up in a rash. They are a UK based company but my order arrived in New Zealand after only 5 days. They have an amazing range of yarns of all types and if you sign up to their newsletter there are discount codes you can use. Made Marion are also stocking Rare yarns which are possum merino blends. I have yet to knit with them but the colours are stunning. greenbiz.comYou might be interested to know that the ‘bamboo’ sold in NZ is almost certainly just rayon/viscose made from bamboo pulp instead of another wood pulp. Some countries (the US and Canada) require that it be labelled as rayon, but there aren’t any guidelines in NZ. More info if you are interested. I do like rayon though – it has its virtues. I stick to cottons and polycottons…but not coz ~I’m not snobbish…it’s just because any time I’ve sewn in anything else (apart from wool/wool blends) its resulted in nothing but trouble. Plus it doesn’t help I’m never quite sure of the qualities of the non natural fabrics…couldn’t really identify them. Oh dear, I just had the most amazing fabric shopping experience at the markets… but one of the measures is defs acrylic. I hummed and haaed over it for ages, it’s thick navy shot with turquoise, and was only $1… so I got it anyway. I was going to sew it into a lined skirt. BTW the amazing market stall was run by a lady who had cleared out her great-aunty’s house after she died. This woman had such a stash of wool, patterns, fabric and accessories that her great-niece now has a weekend job on the market circuit, selling the stuff! She’ll be at a special vintage market next weekend, bringing the vintage fabrics…. I’m there with bells on! Oooh…lucky! I hope you manage to pick up some nice pieces! Oh yes, it overheats, until you get into the wonderful Wellington wind and then it freezes solid! Horrible stuff *shudder*. In spite of inflicting polyester tablecloth damask upon your poor self, I really don’t care to sew synthetics – so hard to hand sew too. I don’t think I’ve any left in my stash either, after so many rounds of destashing! I can imagine! But didn’t it perform well, being dragged across the stage three times a night is no life for anything of better quality! Good for you! It’s great that you made the effort to work with them to have real experience. Especially when you’re teaching I think it’s important to be able to say that you’re not just parroting what you’ve been told, but have actually tried it out for yourself. I teach some sewing classes too, and I’m finding that I’ve got a ton of holes in my education! I sometimes think when you teach you learn more than the students do. I sure did when I taught art classes and tutored at uni. It was a very humbling experience. It was obviously a painful experience, but your students will thank you. I wouldn’t call myself a fabric snob, but the reality is I probably am. I avoid acrylic too, for the reasons you’ve stated, which I found out myself years ago. My favourite fabrics are cotton and rayon, and apart from fake fur the closest I’ve come to synthetic in a very long time was a rayon/poly blend. I’m sort of a fabric snob; for monetary reasons, and thrifty reasons (= using up stash), I use some synthetics, but for a very limited number of purposes. And I avoid them whenever I can. I can’t stand synthetics worn close to my body (sweating! ), and hate that I have to wear synthetic bras when everything else I wear is purposefully natural fibers. One of the reasons why I want to work my way to sewing my own bras. I work under the assumption that acrylic lining is not that bad, when limited to that particular, narrow usage – a jacket lining is rarely worn just next to my body, so I do not mind it THAT much. But yes, it irons awfully. Basically, it does not iron. My favourite random fabic snob tidbit, passed on from my railway-obsessed father: seats in railway cars are covered in wool fabric because wool is pretty much self-extinguishing, thus making it the best possible solution for cases of fire. So if you are sitting in a railway car and the seats are covered in fabric, it’s most probably wool. Ta-da! Can you not get cotton bras in Europe? They are a little harder to find, but there are always a few options in cotton in NZ & US department stores. And instead of acrylic lining fabrics try looking for acetate lining – acetate is a type of processed natural (like rayon) so breaths a little better. I actually knew that about railway (and often) airline seating – courtesy of teaching in the textile industry in wool obsessed NZ! Wool also has the additional benefit of having anti-bacterial properties, a real bonus in a place with crowds of people and massive germ transfer. Remember my post on wool dyed with gold? One of the things they want it for is transport seating – with the addition of gold the wool is anti-microbial and anti-bacterial, as well as anti-static. I keep confusing the synthetics. Thanks for the pointers. Not sure about cotton bras. I have a feeling the only cotton bras I can get here are “sports bras”, and that’s not something I’m looking for! Czech Republic is sadly badly off when it comes to selection of clothes… people keep saying that chain stores in the Czech Republic carry a lower quality clothes than the same chain stores in other countries. I mostly buy my clothes in thrift stores, so I don’t have the overall idea, but I have yet to find normal bras in cotton. And you know how it is – even with the same company, not all the styles fit, and very often none, so finding a new bra is something I do not enjoy. I’m not fond of acrylic or polyester, either. It feels slimy to sew and to wear. I’ve been finding it a pity that while searching for a dress to wear to a wedding I’ve been unable to find anything in my size that is not polyester. Yuck. I’ve got a cotton/rayon blend upstairs that might have to become a dress sometime between now and Thursday. I had the same problem shopping for a dress for a wedding myself last year (too busy to make one). Good luck if you do decide to try for a three-day-dress-miracle! I have very eclectic taste too, but I like the challenge of just having to pick one favourite. I sew to the stuff on the classical station (which also includes Baroque & Romantic), dance to swing, and warble along to everything else! P.S. Just to make things clear, I more or less listen to all of the above, too. E.g. my favourite Christmas album is songs from the first half of 15th century… I just thought I’d go with Mark Knopfler, because that’s a staple with me – except he does not quite fit anywhere either. I’m more of a yarn snob than a fabric snob, but I do find I wear my cotton and wool garments more often – they’re just comfier! And warmer, and more breatheable. I have a couple of second-hand acrylic cardigans, and they have little ‘pills’ on them – ick. I thought you in particular would appreciate that! I’m not a music historian by any stretch of the imagination, but I have enough music friends in all genres to know to get my terms right! I love poly (I’m guessing that is what is meant by acrylics). Poly-cotton is often so much softer than pure cotton. Poly crepe-de-chine is a cheap, but lovely, fabric. If I had to buy “proper” fabric then I simply wouldn’t sew. Fabric snobbery is stupid – it discourages new sewists (because they can’t afford to buy, and perhaps waste, expensive fabric), and it ignores good poly fabrics. Real silk, to me, feels soapy and uncomfortable. Real wool is scratchy and completely unwearable unless it’s lined – and I can’t line it with silk because it feels soapy. Linen feels like lots of tiny pins pricking my skin. I’m going to stick with my polys and viscose and feel very, very sorry for your students who never really learn to sew because they are restrained by the cost of their fabrics. Polyester and acrylic, while both petroleum based synthetics, are manufactured using a different process, and are quite different in how they handle and sew. Acrylic was intended to be an imitation wool, polyester is used as a cotton or silk alternative. 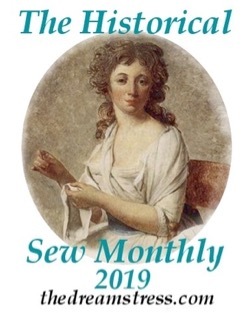 My ‘fabric snobbery’ is based on extensive experience sewing and wearing different fabrics, and advice for people in the industry with far more experience sewing and handling fabrics. When I’m not sure in person, I do a test (that, after all, is the point of this post). If I think a synthetic fabric is good, I’ll use it without a qualm. Unfortunately I don’t find polyester to be equal to, much less superior to, cotton. It doesn’t breath, picks up body odors, and wears poorly. I also can’t agree that natural fibres are more expensive than synthetics, and thus encouraging natural fibres discourages people from taking up sewing. Pure cottons are routinely the same price as poly-cotton blends, muslin/calico comes in pure cotton and is the cheapest fabric available (and one only has to look at Project Runway to see the amazing things that can be done with it), and there are lots of sewing bloggers doing amazing things with old cotton sheets. Last week I bought a silk chiffon on sale for $8 a metre – the cheapest poly chiffon I saw (even on sale) was $12. For me, sewing is about producing things that are better quality and more unique than what is available commercially, and about being as creative as possible with your resources. I’m glad that synthetics are working for you, but as I teacher I have found that students get frustrated at the difficulty with working with many synthetic fabrics, and are disappointed with how they last and wear, and find this far more off-putting than any increase in price. Maybe you just have not found the right wool yet. I cannot argue the price, because I’m a thrifty person who gets most of her clothes second-hand – but I have a 100% wool coat that’s the softest thing I’ve ever touched. Sorry for the extensive P.S.-ing… I wanted to add, the warmth factor of that wool coat is not negligible either. I love your PSing Hana, it makes the whole post feel more like us sitting around drinking tea and sewing together, and chatting! 🙂 I wish you could come to our sewing nights, we would have such fun! Here in my neck of the world, the 100% cotton is very comparable in price to the polys. So I go with cotton when I can. If it is for something no one will see (like undies) or if it is a simply to die for pattern, I will go for a mostly cotton. At my level of sewing experience and the amount of time I spend in my costumes…I haven’t noticed the difference. When you talk about taffettas and other fancier materials though, the price can be as much as 4xs as much for silk compared to polys. Very discouraging for someone on a budget and not quite intermediate sewing skills (I would be terrified to cut into a $45 a yard material!). Add to that the fact that my build is “fluffier” than most and I need more fabric to do the job (10 yards of $45 material= $450 for a costume-the hubby would kill me)! But, I can’t stand the feel of 100% synthetic. It feels slimy. I have used natural/synthetic blends and been happy with the results. (As long as it is mostly natural) I had one fabric of unknown fibers that I landed in a trift shop but I’m fairly sure it was mostly synthetic. It was a challenge to cut (it kept warping and I had to pin it like crazy), a pain to sew (it wanted to fray faster than I could sew it together) and flayed and pilled like crazy while wearing it…especially on the train. It was maddening. I blamed it mostly on the weave but now I see that the fibers may have been a huge factor. I haven’t sewn enough to become a fabric snob yet, but I’m sure I will. I hate the sewing I’ve done so far with synthetics. Let me qualify that, actually. Sewing a swimsuit (spandex) worked like a dream, surprisingly. But sewing with synthetic brocade was the worst thing EVER. Part of that was that I chose the wrong fabric for the style I wanted. Part was that I wasn’t an experienced seamstress. Part was the fabric was so dang slippery that I couldn’t get anywhere with it. But I had the same problem with the 100% silk brocade I sewed with once. I would love to work only with natural fibers, but I’ve also got to deal with a small budget…and silk and wool are so expensive. (Any ideas where to get it really cheap?) So far I’ve stuck with cotton for everything I ever sew. My next sewing projects are blouses from cotton/synthetic blends. I’m not sure how they’ll go! I’ve never worked with acrylic either. I don’t really think of myself as a seamstress, but I don’t like acrylics because they don’t feel right, somehow. (I have not scrupled to use polyesters or polyester + natural fiber blends–they feel different even though they breathe as poorly, I’m not sure why). My take on acrylics is that they can masquerade as naturals (particularly wool) well–until you touch them. Then you can tell all too easily that they’re fakes. And they *do* pill very quickly! Thanks for this post; it was fun and educational as always. There are some man-made /synthetic fabrics and blends that are very good– also called “technical” fabrics that breathe and wick moisture away from the body. I personally love rayon-poly-latex blends and ponte knits as well as others. I also love a little stretch in the wovens too. I do love natural fibers as well as with anything, all different paints in my paintbox. I like to repurpose fabric as well and cannot be a fabric snob when it comes to that. That said, some fabrics clearly are not right for my lifestyle and that includes items that require drycleaning. If it cannot be handwashed and hung, I suppose it is meant for someone with deeper wallets.